Applying the correct PVD Coating to Press Tools and Forming Tools will greatly improve die tool life - use heat treated alloys, together with a very strong coating for best performance. Pick up during Forming is a growing issue during the fabrication of sheet metal parts, due to an increase in the use of high strength and stainless steels. Consider using Chrome Nitride treatment, or Duplex treatment to deliver better performance. The wide range of IONTEC-H Duplex Surface Treatments Hauck HT provide, will always significantly enhance the tool life. A hard nitride layer beneath the PVD coating supports the coating under high forces applied to the surface of tools during operation. 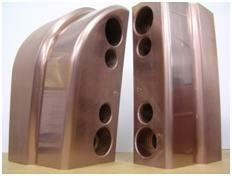 Although a lot of the steels which are IONTEC-H treated by Hauck HT are Press Tool Forming dies (where outstanding results have been achieved), the Duplex Surface Treatment process can, and is, applied very successfully to components, where the steel substrate is normally not hard enough to work in the application. Nitriding the steel before application of the wear resistant PVD coating improves fatigue and indentation resistance. This allows the coating to function correctly. Where a diamond like coating (DLC coating) is required, a PVD coating can be better: Talk to us for more details. Correct Surface Finish of the press tool die is very important if optimum performance is to be achieved. In some cases plasma treatment for steels delivers excellent hardened surfaces for special circumstances. Uncoated BD2 press tool hardened to 58-60Rc repeatedly in tool maintenance for press repair for scoring. 13 tool maintenance notes were raised and associated excessive downtime in press. Maintenance cost estimated at £7K. Since the press tool was IONTEC-HV Duplex treated at a cost of £900, zero maintenance has been required and the tool has made >600K components. BD2 cropping punch hardened to 58-60Rc produces slide links for industrial chain. The chain material is 6mm thick En19T. AIM: To increase the life of the tool, by reducing flank wear.